First of all, could you tell us a little about your background and how you came to contemporary music? I grew up listening to and studying/playing classical music. To be honest, I’m not certain what contemporary music is. I know of dhrupad musicians in India who would assert that what they are doing is contemporary, although the form they are working within was developed at the time of the Renaissance, with elements that date back even further than that. In that respect, I’m not certain that what I do is so new. I believe that the first time one hears a piece of music and is disturbed by it, it becomes radically contemporary to one’s experience. I’ve often come to an understanding of beauty after an initial feeling of disgust. It might have been Mahler or Monk, but hearing such music for the first time can cause one to pay closer attention and transform one’s thinking. It wasn’t until my early twenties that I found Cage, Young or Nono (who are not necessarily contemporary any more). I had to go to India first to break apart my understanding of musical constructs, and to discover what a tone was; a very elemental place to be. After that, matter sounded different to me. Then I had the fortunate experience of studying with both James Tenney and Michael Pisaro. Sounds were again different after those experiences. Then back to dhrupad music, which is so “old”. Perhaps all matter has the possibility of being/becoming radical as well as inherently referential, as it is reshaped, again and again. 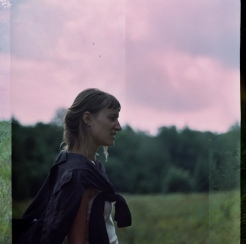 The “artificial” elements within a sound, either experienced in an Eliane Radigue or a Peter Ablinger, could possibly be referential to the beginning of time. The heightened awareness of the periphery, which some of my “contemporaries”, like Mark So, are exploring, causes me to wonder what it is, or how I might hear the world differently through an experience, because of the way the world is now (or has become as far as I understand it). Matter has broken apart, and young people are sailing on certain broken pieces, going further and further into abstracted space. Or, as a result, they have become extreme “realists” or extreme “minimalists”. I believe that the contemporary desire is to separate from the romantic notion that a piece of music emotes something, and rather take the radical stance that if there is an emotive response, it already exists within the listener—and so move towards a kind of beautiful blandness. But this philosophy was present to both Zia Mohiuddin Dagar and Feldman, and possibly even Bach. There’s so much in there I want to pick up on that I’m not sure where to start. Let’s go with ‘beautiful blandness’. It’s a great phrase, and one I could readily apply to a lot of contemporary music that I don’t like, but it seems that you’re not using it as a derogatory term. Could you expand on the notion, and explain how it does or doesn’t apply to your own music? I wanted to emphasise beautiful in front of blandness simply to suggest that blandness can be transformative if the listener is open to it. Recently I was at the Met in New York, in the “contemporary art” wing. I was observing that most of the people around me were experiencing the paintings through the screens on their smart phones, barely stopping to see the brush strokes or colour with their own eyes. I then found myself in a little room with Albers and Lewitt. Two young men came into the room and I heard one of them pronounce, “Do you think there is anything interesting in here?” He gave one quick look around and in a sarcastic manner replied, “Oh, I guess not,” and walked on through. I believe people working within the area of blandness are perhaps reacting to this very modern existence of the viewer/listener who wishes to receive only and not to be asked to meet the work with their true self or true experience undiluted by forces thrown at them. As though a piece of music must “take one somewhere” or overwhelm the senses to be felt, rather than the listener having any responsibility towards it. The word blandness, to me, suggests something entirely different from boredom. Blandness allows for possibility and an activated, experiential space to exist. It’s not necessarily still or quiet, and I’m not necessarily thinking here about music I like or dislike, and well, that is irrelevant. But I do sense a desire in more and more musicians today to linger in the bland in some form and I find that interesting (if the musician making the work is also activated/open to it). I am open to the bland. I feel the necessity, when working with musicians, to ask for a somewhat bland manner of playing (which can be quite difficult!). If the tone is unforced, and simply allowed to exist amongst other tones and the chaotic environment around, then certain colours may emerge more clearly, and the sounds can simply “be”. Multiple tones will be allowed to enmesh and create new timbres, and small differences will become more apparent and welcomed. Actually this allows for more expression to occur, I believe, but only because the musician is not projecting or acting...instead they are asked to become a listener. One may then focus on the relationships rather than being forced into a narrative of a tone coming from here and moving over there. The material I work with tends to be constrictive and stripped. The feeling here is that—each tone already has a complexity and a spectrum present, so that in combination and in space it will move and fluctuate—not as start to finish but as each sounding presence, flawed and whole. Applying this to ‘three bodies (moving)’, I can see immediately what you mean about the ‘bland’ / non-expressive mode of playing (and the trio do it very well! ), but for me the music is irreducibly emotional as a listening experience. It’s a piece that moves/changes very gradually, but I would never have thought of describing it as ‘bland’. For me it has the same sort of quality as the Renaissance polyphony that I like so much, where there’s a sense of hearing an abstract pattern unfolding, but the whole is tinged with a feeling of melancholy, so that it feels like I am being ‘taken somewhere’, and my senses are being almost overwhelmed – and I like that! So am I listening to it ‘wrongly’? From blandness one is open to all possibilities, and this is why I find that perceptually the world becomes more expressive (and expansive) when being approached from a bland space (that is, if we agree on what bland is). I believe it is quite possible that another person will listen to the same piece of music and have little emotional response to it. I think one has to be open to such a piece to allow it to be emotive, otherwise it simply passes them by. But I must say that the first time I heard ‘three bodies (moving)’ I was a bit embarrassed by how lush it felt to me, and well, I am often embarrassed by my pieces! Perhaps because they don’t always fit into the contemporary stance-- intellectualism is the norm amongst my peers. Better to be detached. This sentiment makes perfect sense to me—it is responsive to manipulative forms of expression that can be quite invasive to our lives. It’s not nice to be manipulated, and I don’t wish to take part in that. My intent is not to shock or awe or impress. But I do believe that just as it is radical to be detached—it is also radical to have a lot of feeling. But now I’m just touching on the human condition, which is all part of it. I’m interested in this area—because the material is so clear, so stripped, the harmonic relationships are so carved and defined, and the approach is bland (which doesn’t necessarily mean detached! )—that you then begin to linger on the human condition by navigating within such a naked space. Fluctuations of bow or breath or tone may become little bits of expression, and I find those portions the most compelling. This is humbling, because I really have nothing to do with them other than allowing them to occur. Obviously the musicians have some responsibility! Form is something I can’t run away from, and perhaps is what connects me to classicalness. The form, to me, functions as an opening into a certain kind of listening space—a being. The “song” is already present from the start, yet as it widens the form slowly turns it more and more into focus. I’d like to imagine it (whether or not it is successful) as a live form. Perhaps you do not move from here to there in it, but rather as though you are with it the whole time of listening, seeing the same thing. The more time spent you with it, the more you see it. But you never quite see it, like you could never quite see a thing or a being (or you could never truly know a being). To me, the narrative does not exist—it is not going anywhere else. It is all the same thing. I’m interested in the way your thinking about music brings up these strong spatial metaphors, so that form isn’t an abstract structure, but is a bodily entity, tactile and present. I think I hear those qualities in your music. But can we go back to an earlier metaphor, when you said that ‘matter has broken apart, and young people are sailing on certain broken pieces, going further and further into abstracted space’? Do you think there’s a particular sensibility within your generation of composers / musicians that is leading you to a slightly different perspective from that of your teachers? I remember having a conversation with my friend Madison Brookshire regarding the older generation’s work that we both felt sympathetic to, and that was initiated mostly in the 1960s/70s. We were agreeing, I believe, on developing work we could acknowledge had threads to those initiations of clear or transparent forms. There are also threads like—that one tone isn’t just one, that environmental sound is not necessarily separate from “musical” or “compositional” sound, that a piece could last for days, and that it could also be suggested through a word or an image. In fact, a piece of music could be emerging consistently and quietly from below vents on an island in the middle of Times Square—without anyone on the island even being conscious of its presence. One of my teachers that you mentioned, Michael Pisaro, is making experimental music. By that I mean that his work is still changing rather than locking into something definable—which is a reason why it’s so exciting. James Tenney, too (one of the ‘70s clear form initiators) was experimenting to the end—and doing rather surprising work one would not “expect” him to do necessarily. I think both are good examples of composers being very aware of what is before and around them, being humble to those threads, but at the same time continually exploring pretty strange spaces that warp the beautiful, and being rather present in them too. I think it may be dangerous to suggest that the musicians I feel akin to, in the present time, are developing into a definable collective sensibility—other than being open to the bland perhaps...but everyone has their own unique perspective. ‘Exploring pretty strange places that warp the beautiful’ is a good description of your own music, I think. So finally could you describe the ‘explorations of strange places’ in your current music? What are your ongoing projects, and has your practice evolved since ‘three bodies (moving)’, which is now all of two years old? I started working on ‘three bodies (moving)’ while I was in Delhi, India, in the fall of 2009. I was staying at the home of my teacher, Mani Kaul. He was curating an Asian experimental film festival at that time—so while he was out working long hours I would compose. But in the mornings and evenings we would sit and practice dhrupad (or cook/eat/drink…). Other musicians and young filmmakers would come in and out. Bahauddin Dagar (Zia Mohiuddin Dagar’s son) was there for a while. It was such a lovely time. I only mention that atmosphere because naturally it was affecting the way I was composing. In dhrupad practice, one is aware of a clear form that opens gradually over time. But how one manoeuvres through it - by lingering within tones, by allowing them to dissipate, and in a way trying not to “think”—is what makes the space a live one. The “being” is important. Not where it goes or what it does, but how it exists in a moment, sounding, and coming in and out of focus. My attention was shifting in the process of working on that piece, and I seem to be continuing on a thread with it. But I’ve also been wondering how to bring the periphery (environment) more into direct interaction with the material. So I’ve been thinking of the shades of sound that we hear during a state of listening—layers of sound that “colour” the more foreground elements we’re putting attention to. I’ve been doing things like tuning everything relationally to the electrical cycle or simply writing in “peripheral” parts, and perhaps even including some little noises. I had gone so far into harmonic/spectral clarity that I was beginning to linger on preciousness…the world is really messy and unfocussed, so I need to allow for that too—or at least allow the work to begin to emerge from a chaotic space. “It’s hard not to compare the music I am writing about tonight to the music I wrote about yesterday, given the proximity of the two reviews to one another within this blog’s timeline, and also, to some degree given the shape and form of the music. 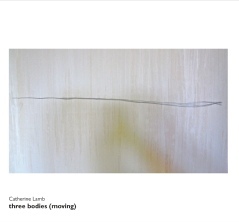 Catherine Lamb’s three bodies (moving), a forty-five minute work released on Another Timbre has a certain sense of Feldmanesque repetition and simplicity to it. In some ways, given that the Feldman piece I reviewed yesterday was set for less conventional instrumentation, the more string focussed trio on this CD by Lamb may even be closer in feel to classic Feldman, but such lines of enquiry make for lazy reviewing, so I will desist. Catherine Lamb is an American composer in her early thirties who has studied under the likes of James Tenney and Michael Pisaro at CalArts, and has extensive knowledge of Indian classical music. At first it isn’t easy to spot any Eastern references in three bodies (moving), but after a while, as the piece progresses and exists around you, its slight lean towards linearity and droning forms leads us in that direction. The piece is performed here by Erika Duke-Kirkpatrick, (cello) Erik km Clark (violin) and Phil O’Connor (bass clarinet). It is very difficult to pick out the exact paths that each instrument takes at any one time in this very beautiful piece of music, but certainly vaguely repetitive, slow, perhaps mournful tones slowly revolve while other tones either match them or sit alongside them. There is a very gentle, simple minimal feel to the work, but like Feldman there is nothing as clinical as Reich here or as romantic as Nyman, just a feeling of complexity formed through very simple, wonderfully beautiful building blocks that ever so slowly slip and slide across one another in manners that feel regimented, but when you really try and pin down the formulas you just can’t. In an interview to accompany the release at the Another Timbre website Lamb talks of a “beautiful blandness” and that fits perfectly for me here, a feeling of simple, unadorned elements combining to produce subtle, immensely pleasing new forms again. When presented with music of this kind I inevitably resort to visual analogies. Here I am reminded for some reason of Cage’s Where R=Ryoanji drawings around pebbles, or perhaps some kind of Brancusi still life where the subjects refused to stay still. The music feels like the simple shapes and forms of those visual works, but constantly in motion. So the beauty of the music still comes from the shapes formed by overlapping musical objects, or the spaces formed between them, but as the piece goes about its gradual way so those objects keep moving, shifting position against one another. There are hundreds of little sections spaced apart by brief silences, with each little cluster informing the one that follows, but rarely staying the same. Hence the Feldman comparison. "Cello, violin and bass clarinet are the three bodies, in motion of a kind. 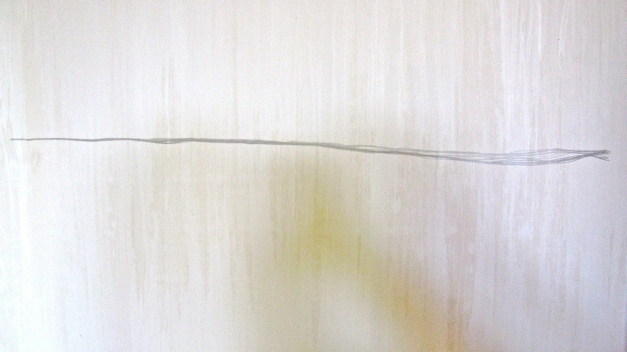 A wispy trail emerges of muted and equivocal tones, tentative motifs, queasy intervals and momentary accord. Violist and composer Catherine Lamb studied with James Tenney and Michael Pisaro at the California Institute of the Arts, where this 45 minute composition was recorded last September. Three bodies (moving) may recall Morton Feldman in the calculated interdependence of its duration and its avoidance of drama, its reluctant momentum and quiet persistence. But the uneasy beauty of Lamb's sparse, rather chaste polyphony is distinctive, and strangely affecting. The cello and bass clarinet take a long time to acquire the depth and warmth you might conventionally expect from them. that development does eventually occur, but it's rather like experiencing slow changes in the quality of light that modify colours, subtly alter the appearance of things and subliminally affect our mood. this is perceptual rather than contemplative music; music to change with and within."